Although there's nothing prettier than looking out the car window at a landscape sparkling with snow, winter also brings with it a number of serious driving hazards. From dangerously cold temperatures to slick road surfaces and unpredictable weather conditions, winter driving presents some challenges. 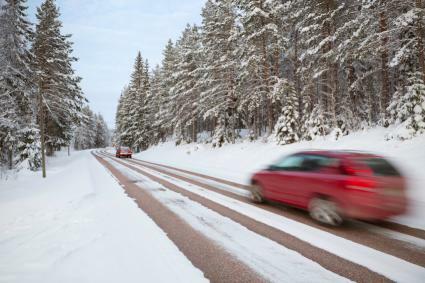 According to the United States Department of Transportation, more than 583,000 crashes occur each year due to snow, slushy roads, and icy pavement. Stay safe by remembering some important tips. Before you begin your drive, whether you're traveling in the winter or simply heading out to the grocery store, it's important that you take a few precautions. Keep these tips in mind before you even get in your car. Before you head out during the winter months, it's always a good idea to check the weather forecast. You never know when a storm may be coming. If you are going on a long trip, check the forecast for your destination as well as various points along the way. If the weather forecast looks particularly bad, you may want to postpone the trip until a later time. Your car's tires are also very important when it comes to winter driving, according to Matt Edmonds, vice president of TireRack.com, an online source for tire reviews and tire, wheel, and performance accessory purchasing. "If temp are near or below freezing frequently where you live and drive, then winter tires are the better choice to increase traction and safety," Edmonds says. "Winter tires give drivers more traction because the tread compound stays flexible when temperatures go below 45 degrees, the tread designs have more "biting edges," and the tread depth helps move volumes of snow, ultimately allowing the tires to grip the road better." There are different types of winter tires, each designed for specific conditions. When shopping, consider your needs, and replace all four tires with those designed for your weather conditions. "Depending on your needs, this may mean either studless ice and snow tires or performance winter tires if winter is light snow and cold temperatures," Edmonds says. Before you leave, put together an emergency kit. According to Scientific American, you can survive for three days without water and up to three weeks without food. Staying warm should be your main objective, though: a person will only survive for about three hours without shelter. 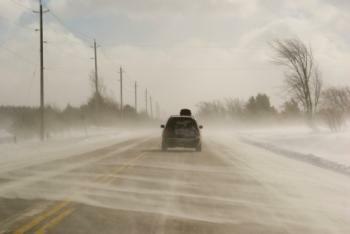 If you have a cell phone, you should be sure you carry it on any winter driving excursions. Check to make sure your phone is fully charged before you leave the house. Check your anti-freeze levels and replace if necessary. Replace your battery if it is close to the end of its useful life. Inflate your tires to the proper PSI (pounds per square inch). Check your windshield wiper blades and replace if necessary. Top off your brake fluid and power steering fluid. Get a cold weather oil change. Make sure you have a spare tire and it is properly inflated. Have your heating and defrost system checked. Check the belts and hoses, change your spark plugs, and have your brakes inspected. Make sure you have tire chains in trunk of car if you use them. Once you do get behind the wheel, you'll need to be extra alert. You may also need to change a few of your warm weather habits. Keep these tips in mind. Although it may be tempting to avoid standing out in the cold to fill up your tank, the last thing you want to happen during winter driving is to run out of gas in between service stations. Make a point of keeping at least a half tank of gas in the vehicle at all times. Instead of rushing to get to your destination in the same amount of time it would take during the warmer months, accept that it will take longer to arrive and plan to leave a bit earlier. That way, you are less likely to become frustrated at the amount of time the trip is taking and less likely to speed up in an attempt to arrive sooner. Ice and snow are slick, and black ice is all but invisible. Even if roads look clear, you may find that stopping takes longer than you expect. Leave plenty of space between your car and others. Edmonds recommends doubling the distance you would normally leave between cars, giving yourself plenty of time to stop or react if the car ahead of you runs into trouble. 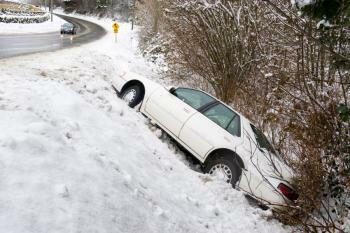 While it may be tempting to take a shortcut to try to save time, this is not a good idea in the winter months. You will want to stick to main highways as much as possible. There are more people around on these roads, giving you more options for help if something goes wrong. Also, major roads tend to get cleared more often, which means they are easier to navigate. If you do run into a problem, it's important that you handle the situation carefully. Keep these tips in mind. If you get stuck or have car trouble, stay with your vehicle. It provides you with shelter from the elements, and emergency personnel will find it easier to find your vehicle than to locate an individual on foot. Make sure that the exhaust isn't blocked off by snow, and then stay put. If you get stuck in deep snow, do not press on the gas pedal and spin your tires, as this will dig you in deeper. "What you need is traction," Edmonds says. "If possible, a good source is the floor mats in your car. Take them and stick them under the back edge of your drive tires and then slowly reverse out, staying in the track you created going in." You can also use a shovel to remove snow, if necessary. If you don't have floor mats, pour sand, kitty litter, salt, or gravel on the path in front of the wheels to provide traction. Edmonds recommends that drivers act early to prepare of winter driving. "Winter is inevitable," he says. "Don't hesitate."